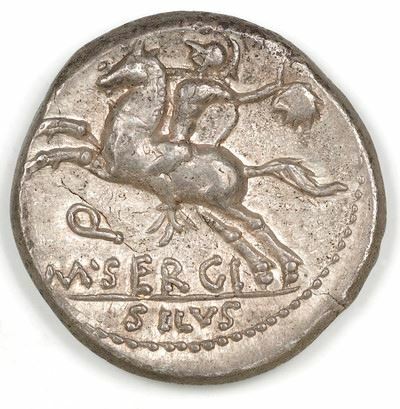 M. Sergius Silus was one of the moneyers for the year 116 BC. He was a Quaestor, as indicated by the Q on his coins. His grandfather was Marcus Sergius, a Roman general during the Second Punic War (218 to 201 BC). He is famed in prosthetics circles as the first documented user of a prosthetic hand. The metal hand was constructed to allow him to hold his shield in battle. Obverse: Helmeted head of Roma facing right; EX SC before; ROMA * behind. Reverse: Horseman galloping to the left; holding sword and severed head in hand; Q and M SERGI below; SILUS in exergue.